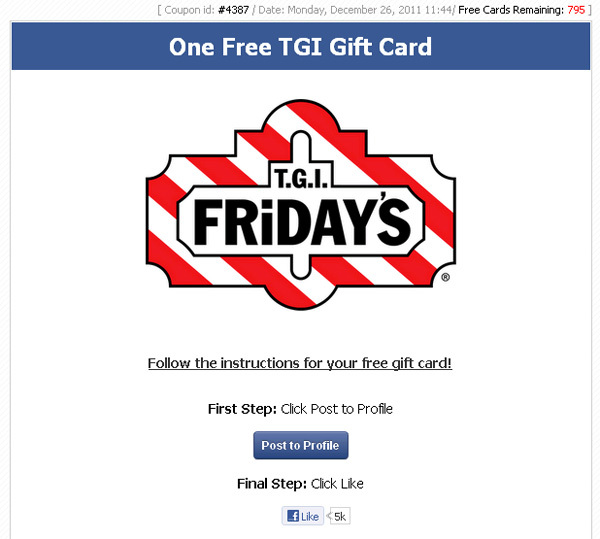 TGI Friday’s is currently giving away $100.00 gift cards to all facebook users!! Don’t let this slick looking page fool you! As with any “special offer,” you have to read the fine print. The ‘Program Requirements’ state that you have to complete a survey and a total of 8 sponsor offers. 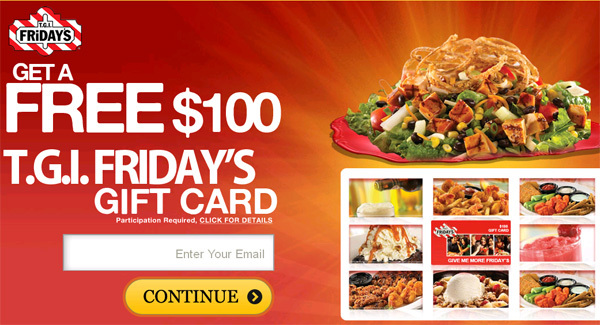 Chances are, after you have completed the offers it isn’t going to be worth the Gift Card, assuming that part of the promotion isn’t a scam. Also keep in mind the scammers are acquiring a treasure trove of your personal data. You will be required to provide your name, address, phone numbers and date of birth. This will enable the shady marketers to not only spam your Facebook account, but also harass you via snail mail, phone calls and text messages.